This example shows how to work with consumer (retail) credit panel data to visualize observed default rates at different levels. 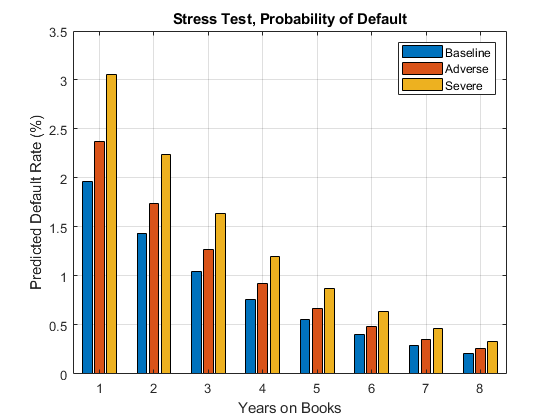 It also shows how to fit a model to predict probabilities of default and perform a stress-testing analysis. The panel data set of consumer loans enables you to identify default rate patterns for loans of different ages, or years on books. You can use information about a score group to distinguish default rates for different score levels. In addition, you can use macroeconomic information to assess how the state of the economy affects consumer loan default rates. 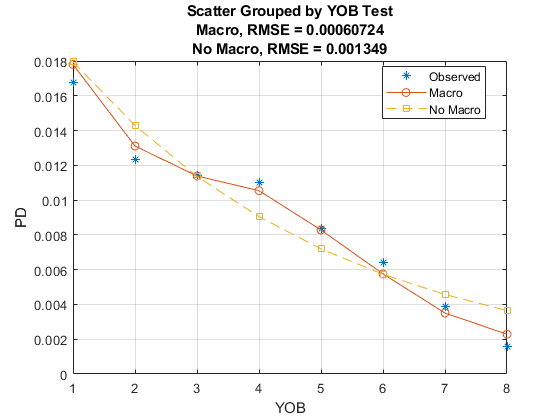 A standard logistic regression model, a type of generalized linear model, is fitted to the retail credit panel data with and without macroeconomic predictors. The example describes how to fit a more advanced model to account for panel data effects, a generalized linear mixed effects model. However, the panel effects are negligible for the data set in this example and the standard logistic model is preferred for efficiency. 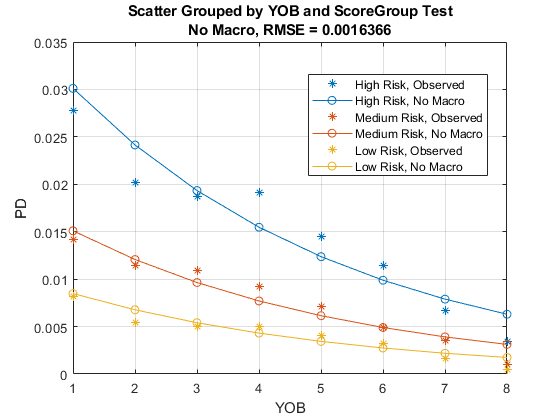 The standard logistic regression model predicts probabilities of default for all score levels, years on books, and macroeconomic variable scenarios. When the standard logistic regression model is used for a stress-testing analysis, the model predicts probabilities of default for a given baseline, as well as default probabilities for adverse and severely adverse macroeconomic scenarios. For additional information, refer to the example Modeling Probabilities of Default with Cox Proportional Hazards, which follows the same workflow but uses Cox regression instead of logistic regression, and also has additional information on the computation of lifetime PD and lifetime Expected Credit Loss (ECL). ScoreGroup: Credit score at the beginning of the loan, discretized into three groups: High Risk, Medium Risk, and Low Risk. Default: Default indicator. This is the response variable. GDP: Gross domestic product growth (year over year). Market: Market return (year over year). The variables YOB, Year, GDP, and Market are observed at the end of the corresponding calendar year. The score group is a discretization of the original credit score when the loan started. A value of 1 for Default means that the loan defaulted in the corresponding calendar year. There is also a third data set (dataMacroStress) with baseline, adverse, and severely adverse scenarios for the macroeconomic variables. This table is used for the stress-testing analysis. This example uses simulated data, but the same approach has been successfully applied to real data sets. Load the data and view the first 10 and last 10 rows of the table. The panel data is stacked, in the sense that observations for the same ID are stored in contiguous rows, creating a tall, thin table. The panel is unbalanced, because not all IDs have the same number of observations. 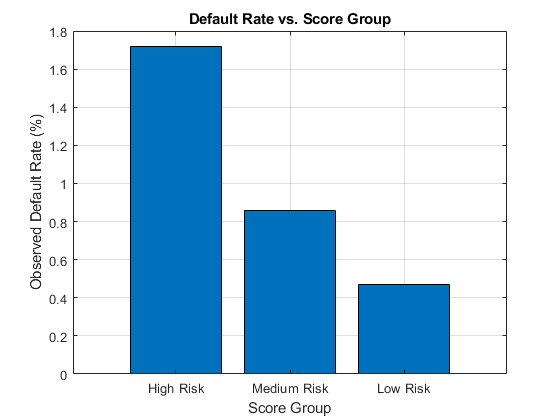 Use the credit score group as a grouping variable to compute the observed default rate for each score group. For this, use the groupsummary function to compute the mean of the Default variable, grouping by the ScoreGroup variable. Plot the results on a bar chart. As expected, the default rate goes down as the credit quality improves. 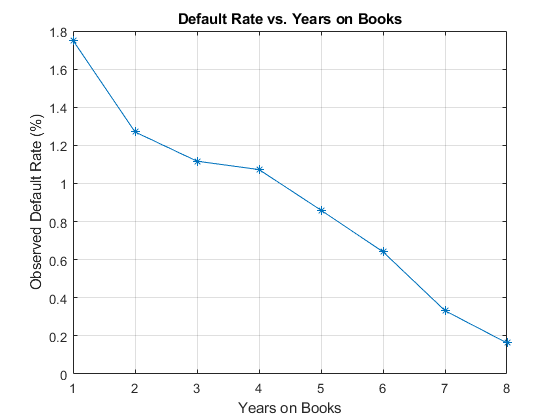 Next, compute default rates grouping by years on books (represented by the YOB variable). The resulting rates are conditional one-year default rates. For example, the default rate for the third year on books is the proportion of loans defaulting in the third year, relative to the number of loans that are in the portfolio past the second year. In other words, the default rate for the third year is the number of rows with YOB = 3 and Default = 1, divided by the number of rows with YOB = 3. Plot the results. 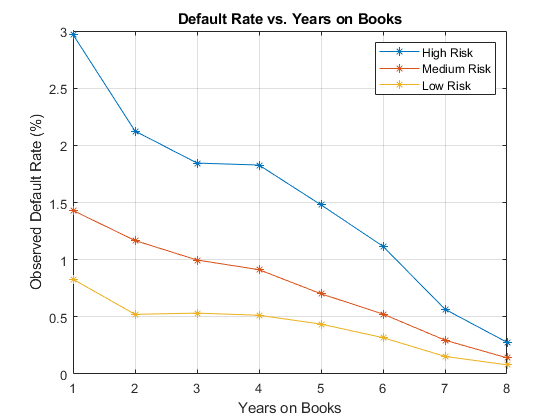 There is a clear downward trend, with default rates going down as the number of years on books increases. Years three and four have similar default rates. However, it is unclear from this plot whether this is a characteristic of the loan product or an effect of the macroeconomic environment. Now, group both by the score group and number of years on books and then plot the results. The plot shows that all score groups behave similarly as time progresses, with a general downward trend. Years three and four are an exception to the downward trend: the rates flatten for the High Risk group, and go up in year three for the Low Risk group. The data contains three cohorts, or vintages: loans started in 1997, 1998, and 1999. No loan in the panel data started after 1999. 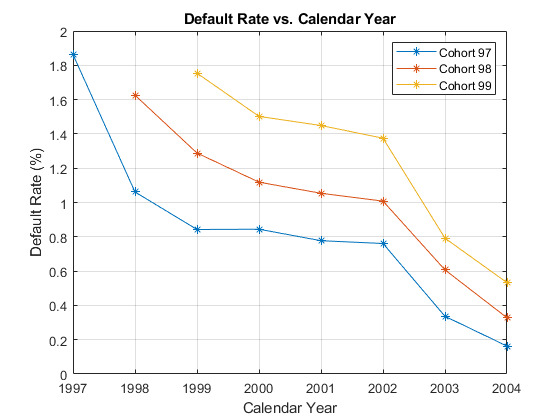 This section shows how to visualize the default rate for each cohort separately. 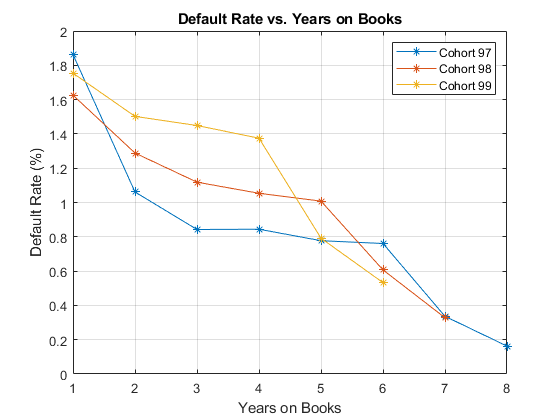 The default rates for all cohorts are plotted, both against the number of years on books and against the calendar year. Patterns in the years on books suggest the loan product characteristics. Patterns in the calendar years suggest the influence of the macroeconomic environment. From years two through four on books, the curves show different patterns for the three cohorts. When plotted against the calendar year, however, the three cohorts show similar behavior from 2000 through 2002. The curves flatten during that period. After you visualize the data, you can build predictive models for the default rates. Split the panel data into training and testing sets, defining these sets based on ID numbers. 1M is an indicator with a value 1 for Medium Risk loans and 0 otherwise, and similarly for 1L for Low Risk loans. This is a standard way of handling a categorical predictor such as ScoreGroup. There is effectively a different constant for each risk level: aH for High Risk, aH+aM for Medium Risk, and aH+aL for Low Risk. The 1 + ScoreGroup terms account for the baseline constant and the adjustments for risk level. Set the optional argument Distribution to binomial to indicate that a logistic model is desired (that is, a model with log odds on the left side). For any row in the data, the value of p is not observed, only a 0 or 1 default indicator is observed. The calibration finds model coefficients, and the predicted values of p for individual rows can be recovered with the predict function. The Intercept coefficient is the constant for the High Risk level (the aH term), and the ScoreGroup_Medium Risk and ScoreGroup_Low Risk coefficients are the adjustments for Medium Risk and Low Risk levels (the aM and aL terms). The default probability p and the log odds (the left side of the model) move in the same direction when the predictors change. Therefore, because the adjustments for Medium Risk and Low Risk are negative, the default rates are lower for better risk levels, as expected. The coefficient for number of years on books is also negative, consistent with the overall downward trend for number of years on books observed in the data. The (1|ID) term in the formula adds a random effect to the model. This effect is a predictor whose values are not given in the data, but calibrated together with the model coefficients. A random value is calibrated for each ID. This additional calibration requirement substantially increases the computational time to fit the model in this case, because of the very large number of IDs. For the panel data set in this example, the random term has a negligible effect. The variance of the random effects is very small and the model coefficients barely change when the random effect is introduced. The simpler logistic regression model is preferred, because it is faster to calibrate and to predict, and the default rates predicted with both models are essentially the same. Predict the probability of default for training and testing data. Visualize the in-sample fit for all score groups. The out-of-sample fit can be computed and visualized in a similar way. The trend predicted with the previous model, as a function of years on books, has a very regular decreasing pattern. The data, however, shows some deviations from that trend. To try to account for those deviations, add the gross domestic product annual growth (represented by the GDP variable) and stock market annual returns (represented by the Market variable) to the model. Expand the data set to add one column for GDP and one for Market, using the data from the dataMacro table. Fit the model with the macroeconomic variables by expanding the model formula to include the GDP and the Market variables. Both macroeconomic variables show a negative coefficient, consistent with the intuition that higher economic growth reduces default rates. 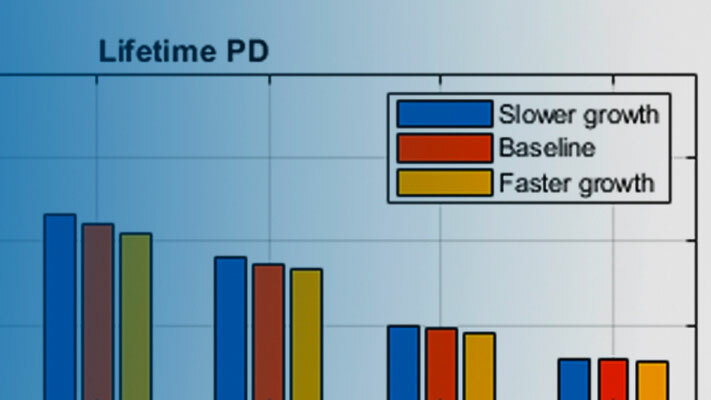 Predict the probability of default for the training and testing data. Visualize the in-sample fit. As desired, the model including macroeconomic variables, or macro model, deviates from the smooth trend predicted by the previous model. 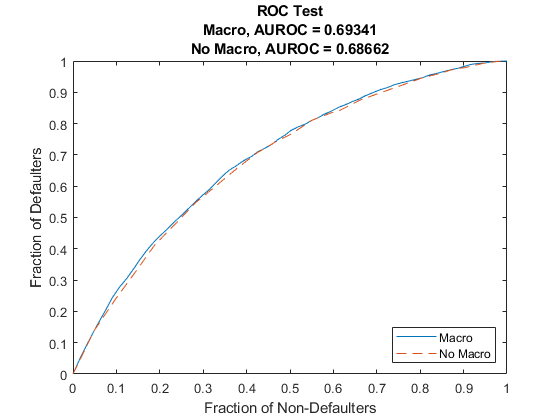 The rates predicted with the macro model match more closely with the observed default rates. Visualize the in-sample fit for all score groups. 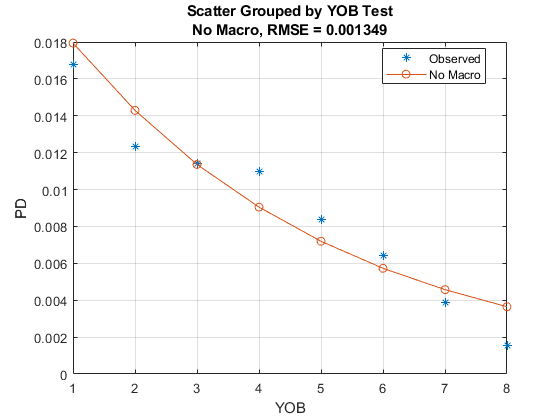 Use the fitted macro model to stress-test the predicted probabilities of default. Assume the following are stress scenarios for the macroeconomic variables provided, for example, by a regulator. Set up a basic data table for predicting the probabilities of default. This is a dummy data table, with one row for each combination of score group and number of years on books. 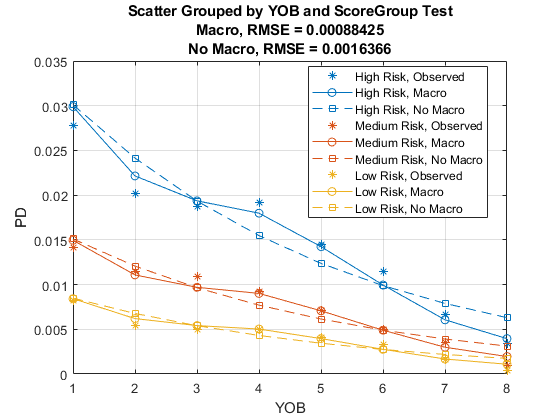 To make the predictions, set the same macroeconomic conditions (baseline, adverse, or severely adverse) for all combinations of score groups and number of years on books. 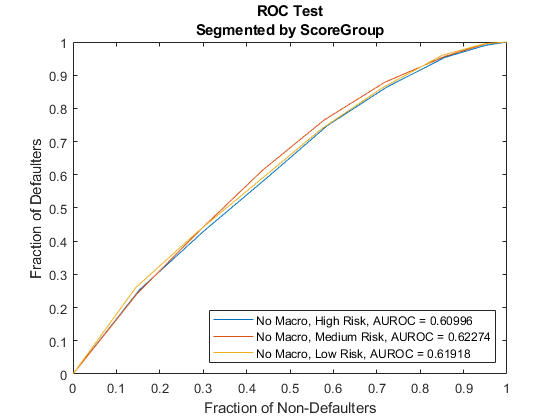 Visualize the average predicted probability of default across score groups under the three alternative regulatory scenarios. Here, all score groups are implicitly weighted equally. However, predictions can also be made at a loan level for any given portfolio to make the predicted default rates consistent with the actual distribution of loans in the portfolio. The same visualization can be produced for each score group separately. Generalized Linear Models documentation: https://www.mathworks.com/help/stats/generalized-linear-regression.html. Generalized Linear Mixed Effects Models documentation: https://www.mathworks.com/help/stats/generalized-linear-mixed-effects-models.html. Federal Reserve, Comprehensive Capital Analysis and Review (CCAR): https://www.federalreserve.gov/bankinforeg/ccar.htm. European Banking Authority, EU-Wide Stress Testing: https://www.eba.europa.eu/risk-analysis-and-data/eu-wide-stress-testing.